Conceptual Physics: How is blood pressure measured? 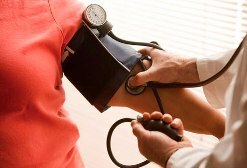 A person's arterial blood pressures are usually measured with the help of an inflatable cuff wrapped around the upper arm at the level of heart. A stethoscope is used to monitor the sound of the blood flowing through an artery below the cuff. The cuff is first inflated until the flow of blood stops then the pressure of the cuff is gradually reduced until the blood just begins to flow, which is recognized by a gurgling sound in the stethoscope. This pressure, called systolic, represents the maximum pressure the heart produces in the artery. The pressure in the cuff is then further reduced until the gurgling stops, which corresponds to the restoration of normal blood flow. The pressure at this time, called diastolic, represents the pressure in the artery between the contractions of the heart. Physicians express blood pressures in torr, where 1 torr is the pressure exerted by a column of mercury 1 mm high; it is equivalent to 133Pa. The torr was formerly referred to as the "millimeter of mercury", abbreviated mm Hg. The unit is named after Evangelista Toricelli (1608-1647), the Italian Physicist who invented the barometer, which measures atmospheric pressure. Average atmospheric pressure is 760torr. In a healthy person the systolic and diastolic blood pressures are, respectively, about 120 and 80torr.